This article is a continuation of the Fettiplace ancestry of Thomas Dudley, Governor of the Massachusetts Bay Colony. Previously covered were Thomas Fettiplace and his son John Fettiplace. This is the third generation of this line that can be traced with certainty, anything above Thomas is a guess. So, here is what I know about Richard Fettiplace and his wife Elizabeth Bessels. Richard's parents were John Fettiplace and Joan Fabian Horne Fettiplace Estbury. John was a successful London draper (cloth merchant) who came to the attention of the king and was appointed Esquire of the Body of the King around 1455. King Henry was deposed in 1460 so ending John's court connections. He married about that time a wealthy London widow, Joan Horne, nee Fabian, whose husband Robert Horne had been a stock fishmonger, alderman and one time Sheriff of London. 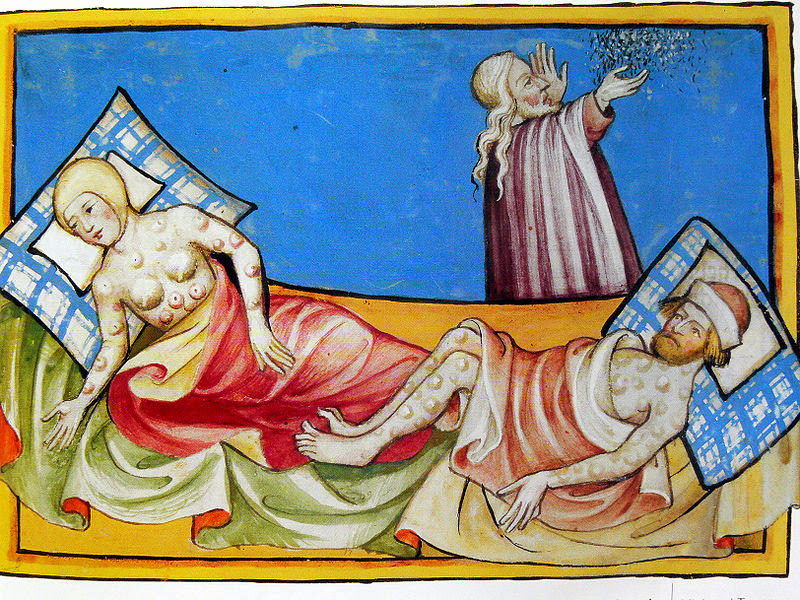 John and Joan had five children in quick succession, four boys and one girl before his untimely death in 1464. Richard was the oldest and his father's heir. He inherited the manor of East Shefford in Berkshire and New Langport in Kent. Joan moved her family from London to their home at East Shefford. The children's estate was put into the hands of James Fettiplace, John's brother and the children's uncle. He lived at nearby Maidencourt, Berkshire. Joan remarried to a local man John Estbury of Antwick's manor in Letcombe Regis. When Richard was about 25 years old he married the only daughter and heiress of Williams Bessels and his wife Alice Harcourt Bessels. Her name was Elizabeth. The marriage took place around 1485.She brought the manor of Besselsleigh into the Fettiplace family. The Bessels were an old established Berkshire family as were the Fettyplaces'. That being said, William came into the manor of Leigh in an unusual way. 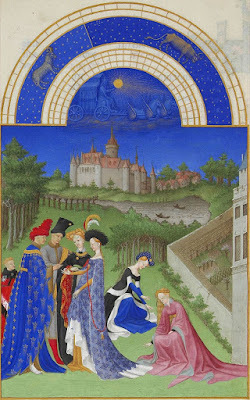 In 1424 Sir Peter Bessels died without an heir. His wife was able to hold the manor of Leigh for her lifetime. After much squabbling by the trustees and the death of Margery the widow of Sir Peter, the manor finally passed to William Bessels, possibly a distant cousin of Sir Peter. Richard and Elizabeth seems to have lived quietly in East Shefford. His did not make much of a mark on the public record. They had quite a few children including a daughter Ann who married Edward Purefoy. Now all over the web and is a few books it says that Anne Fettiplace was born in Little Shelford, Cambridgeshire also known as Shelford Parva. But, the Fettiplaces are not known to have had any land there. Why would she been born there? I think this is an error and that she was born in Shefford like the rest of them. Richard was never knighted and therefore was not Sir Richard. Richard died in 1511, in what was still a Catholic country. He asked to be buried in the church of Poughley Priory, a house for Austin Canon Friars. The Priory was located at Chaddlesworth near Great Shefford. He left money to the Priory and gave them land, asking in return for 99 years worth of prayers. 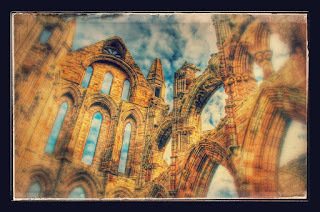 He did not get his money's worth as the Priory was dismantled in 1524 by Thomas Cromwell during the dissolution of the monasteries. In January 1527, Edward Fetyplace, Richard's son, treasurer to the duke of Suffolk, wrote to Thomas Cromwell, upbraiding him with breaking his word as to granting him the site of Poughley, on the faith of which he had given Cromwell 40s. at the time of its dissolution, and yet the lease had been granted to another man. This letter is of particular interest, as showing that the house of the dissolved priory was for a time occupied by scholars of Wolsey's great college then in course of erection. In February 1529, Fetyplace wrote again to Cromwell desiring his interest that he might be assured of more years in the farm of Poughley. From this letter it is evident that Cromwell had been recently visiting the dismantled priory, as Fetyplace records a visit to Poughley, on 'the Thursday after our departing,' of one John Edden who came with a cart to carry off such stuff as was appointed to go to Wolsey's College at Oxford. 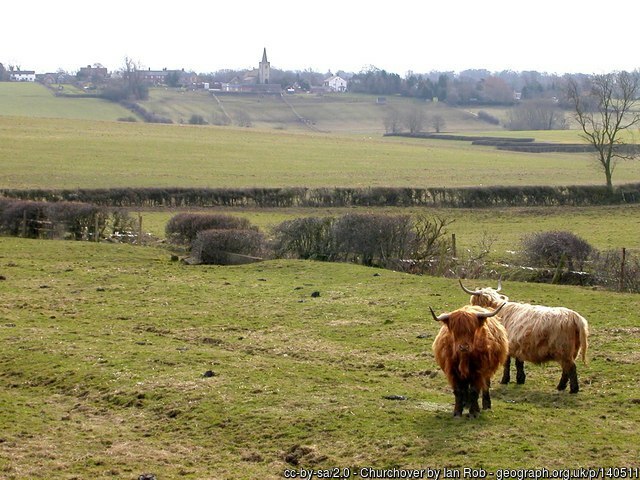 John Fettiplace was born about 1424, most likely at his parent's estate of East Shefford in Berkshire. His father was Thomas Fettiplace and his mother was Beatrice, a Portuguese woman who was possibly descended from King Alonoso III through an illegitimate son.He was the second son of a fourth son. If he was going to earn a living he was going to have to work for it. And so he did. ed a working Draper and he eventually became a very rich draper. but, back to the beginning. In 1447 the King's brother, Duke Humphrey died suddenly. He had been one of the 24 Knights of The Order of the Garter. There were several good candidates to fill the now vacant spot, but the honor went to King Alphonso of Portugal. King Henry commissioned the garter from the London goldsmith Matthew Philips. The garter was not the stretchy thing you see thrown at weddings, it looks more like a small blue belt, that when buckled was/is worn around the left calf. Of course it would be covered with jewels or pearls and the buckle would be made of gold. Along with the the garter went the sumptuous robes worn by the recipient. Once completed these items had to be delivered to King Alphonso, in Portugal. Who better to deliver them than John, son of Beatrice, a descendant of the royal house of Portugal. John was paid the hefty sum of 40 pounds for his expense. How did John come to the attention of Court and allowed the honor of this mission. I think it was probably the Earl of Shrewsbury, who was close to the Royal Family who was the instigator of John's rise. John Talbot, Earl of Shrewsbury was the brother in law to John's mother, Beatrice. She had been married to his brother, Gilbert. In 1455 John was a member of the Royal Household and no less Esquire to the King's Body. 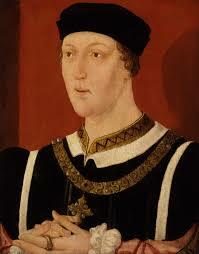 The King in question was the ill fated Henry VI. His Queen was Margaret of Anjou. 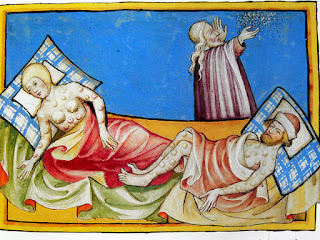 The job of esquire to the body was one of an attendant of the King. They helped him dress and undress, they were around him day and night to meet his every need. How John achieved this appointment is unknown. Although it has been suggested that his mother might have had some influence I am more incline to believe that it might have been his mother's brother in law, The Earl of Shrewsbury, who might have brought John into the royal sphere. 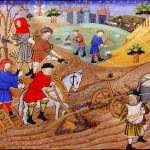 The 15th century was the heyday of the wool market in England. Men could become fantastically rich dealing wool and the cloth made from it. The best wool in Europe was from England, the best weaver were in Flanders. The raw wool was shipped to Flemish ports and returned to London for the Drapers to sell. John set himself up as a wool merchant in the section of London called Lothbury. There is still a Lothbury Street in London, but the area was all destroyed at the time of the Great Fire including the parish church of St. Margaret's of Lothbury. 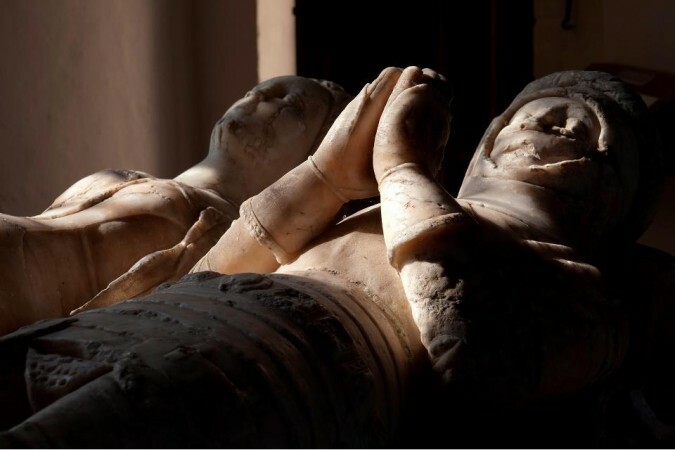 In the late 1450's, John married the widow Joan Fabian Horne. Her husband had been Robert Horne. 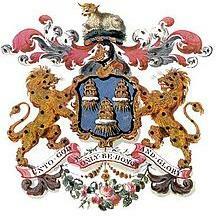 He was a very successful fishmonger who served as both Alderman for the Bridge Ward and Sheriff of London. He is best known for his part in the rebellion known as Cade's Rebellion which tore through London in 1450. This rebellion was a protest by men in Kent and Sussex against the inept government of Lancastrian King Henry VI. Although first welcomed by the citizens of London, they rebels quickly lost their favor when they looted the city. Robert Horne was throw in prison and only escaped with his life by paying a huge ransom. This rebellion was the beginning of the undoing of King Henry and eventually lead to the War of the Roses. Joan was the daughter of Edward Fabian. When Robert died he left her with four small children and a large bank account. I doubt she was widowed long. Joan and John had four sons, Richard, Anthony, Thomas, and William and one daughter Margaret. Whatever influence John had accrued at court as Esquire to the Kings Body and from the Earl of Shrewsbury came to a screeching halt on 10 July 1460 at the battle of Northampton. The King was captured by the Yorkist forces and the Earl was killed defending him. In March of 1461 England had a new King, the Yorkist King Edward IV. Henry would briefly regain his throne in 1470 but John was dead by then. John certainly did honor both his parents with a fabulous alabaster tomb in their small church of St. Thomas in East Shefford. The tomb remains today in the now protected church, a cold silent monument to ancestors long gone. John himself died in 1464, leaving his widow once again holding the bag with a gaggle of small children. John had a will and left his children a small fortune. Their Uncle James Fettiplace was charged with managing their estate until they came of age. John's heir was his eldest son Richard. Unlike his father he was not in trade, but lived the life of the landed gentry in Berkshire on his estate of East Shefford. Joan remarried, again rather quickly. Her third husband was John Estbury of Antwick's Manor in Berkshire. He was probably no stranger to Joan as his manor was only a few miles from East Shefford. 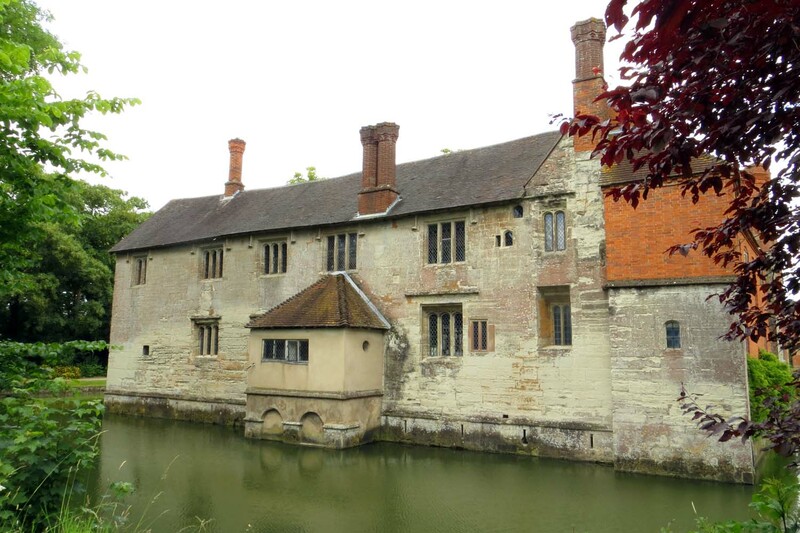 In fact the manor of East Shefford was owned by the Eastbury Family in previous century. 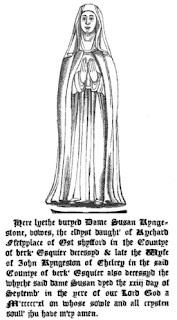 When Joan died she was buried next to John Fettiplace at St. Margaret's Lothbury. Joan's date of death is unknown. I wrote a blog post some years ago about what I call "trying to meet in the middle." 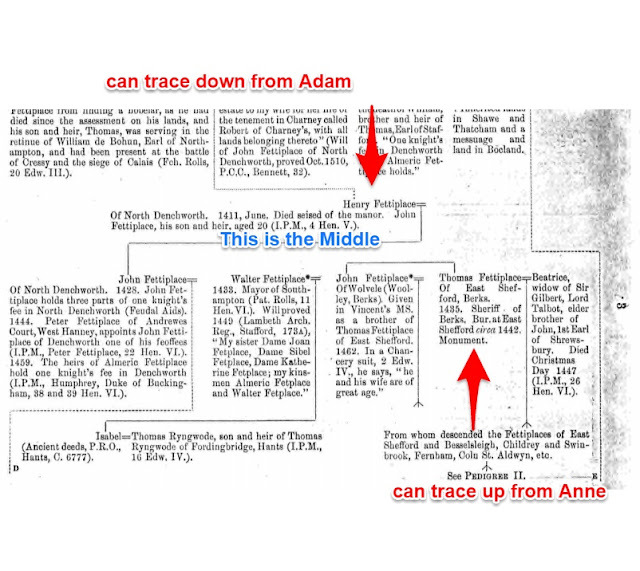 This is that genealogical problem where you think you know the ancestry down to a certain point and up to a certain point but you cannot connect those two points. You can't meet in the middle. The Fettiplace ancestry of Thomas Dudley almost definitely began with Adam Fettiplace of Oxford in the 12th century and can be traced down to his descendants and it can be traced up to Thomas Fettiplace born about 1394. But, we can't connect Thomas to Adam's line. This article will deal with Thomas Fettiplace and his descendants to Anne Fettiplace who married Edward Purefoy. They were the great grandparents of Thomas Dudley on his mother's side. So, there have been three major articles written about the Fettiplace Family and most of what you find on the web is from these articles. The first was published in 1889 by James Robinson Planche' who was appointed the Rouge Crouix Pursuivant in 1854. He wrote extensively about the family, beginning with Adam Fettiplace. He wrote that it was his conviction that Henry Fettiplace, who died seized on the manor of Denchworth in 1416, was either the uncle or father of Thomas. In 1911, J. Rentyon Dunlop wrote an lengthy article on the family. He wrote that Thomas was known to have had a brother John of Woolley Park. He and a Peter Fettiplace of North Denchworth, the representative of the original line, were contemporaries. Peter was the son of John Fettiplace of North Denchworth. Peter and Thomas each served as High Sheriff of Berkshire and both served in 1436 as Comm missioners of Array. Dunlop says, "it is here suggested, that although probably first cousins, it quite possible they were brothers." For this to be true, John of Woolley would have to be John of Denchworth, which has not been suggested by anyone that I can find. Then John and Thomas would both be sons of Henry of Denchworth, Thomas being the fourth son. Nearer our current time, Donald Lines Jacobus wrote and article for "The Register," in 1969, about the Fettiplace Family. In his two part article, part two begins with Thomas. Of is his ancestry he writes, "In spite of his high rank and social position, enhanced to be sure by the exalted birth of his wife, his descent from Adam Fettiplace, the first definitely known progenitor of this ancient family, has never been worked out. Donald L. Jacobus was one of the finest american genealogist. English historian and genealogist David Nash Ford has an extensive website on Royal Berkshire History, which includes many of the leading Berkshire families. The Fettiplace articles by Dunlop and Plance' are both reprinted on this website. In a bio of Thomas Fettiplace, the author, unnamed, writes that the parentage of Thomas is "far from certain." But, it "seems likely that he was a son of Henry Fettiplace of North Denchworth." No documentation is offered for this statement, but it is presumable based on the speculation raised in the two previously mentioned articles. So was Thomas the son of Henry Fettiplace of North Denchworth. It is possible that Henry was his father and it is possible that Henry was not his father. More than that, I cannot say. Sorry. Thomas is believed to have been a fourth son, regardless of who his father was. Fourth sons had a difficult time back then, when the first son got the lion's share of his father's estate. These guys had to go out and make their mark on their world. This could be done by excelling in martial arts or if the world of warfare was not to your interest, by managing the estates of a warrior. This is the route chosen by Thomas. In 1413 Thomas was appointed steward to Gilbert, Lord Talbot. at his manor of Bampton in Oxfordshire. This manor had been in the Talbot family since 1327 when it was given as part of a dowry at the marriage of Richard Talbot and Elizabeth Comyn. However, Talbot's main lands were in the Welsh Marches, the borderlands between England and Wales. The men who held these lands are called the March Lords and were semi-independent from the King. The first ten or so years of the 15th century saw frequent fighting between the English and the Welsh who briefly rid Wales of their English overlords only fall under their control by 1409. It is possible that the Talbot family spent time in the Oxfordshire home to avoid the ongoing military conflict. As steward, Thomas was responsible for the day to day running of the estate. The steward also played a major role in the manorial court system. All in all it was a good gig for a fourth son, in fact, may stewards became wealthy men. 1413 saw the crowning of the most military of kings, Henry V. He is described as a cold and ruthless soldier. Once crowned he immediately began preparing to invade Normandy, which he did in 1415. The next few years brought amazing military victories for England at Harfleur and the amazing defeat of the French at Agincourt. In 1416 the last Welsh "Prince of Wales," died, and Henry was able to give France his full attention. In 1417 he again invaded France, his target was the city of Rouen. After an almost two year siege the once great city surrendered, it's citizens dying of starvation and illness. Also dying at the siege was Gilbert, Lord Talbot, Lord of the manor of Bampton. Thomas was married in 1422. His wife was the Lord Talbot's widow, Beatrice. Beatrice was a young widow with only on child, a daughter named Ankaret for her Talbot Grandmother. Beatrice was also a foreigner. She was Portuguese. Let me say right out that she was not the daughter of King Joao (John) of Portugal by either his legal wife, Phillipa Lancaster or a mistress as is seem on multiple websites. All current research points to her being a descendant of King Alphonso III of Portugal and his mistress Mariana Pirez de Enxara. Alphonso died in 1279 and if true would have been Beatrice's 3X great grandfather. She was not a princess. Suffice it to say, no one really knows who her father was. 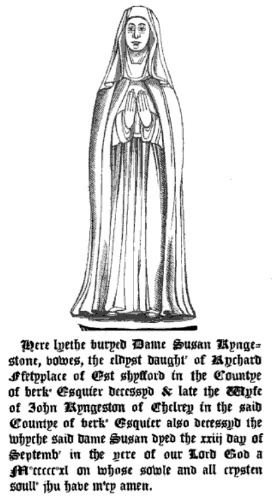 Immediately following the death of her husband, Beatrice was given one third of the manor of Bampton as her dower. In 1419 she was given full custody of the estate. Sadly, her daughter and Lord Talbot's only heir, died in 1422. This left Beatrice and her then husband Thomas Fettiplace with only her dower third. She exchanged this dower for the right of tenancy. Gilbert's lands and title passed to his brother John, later the Earl of Shrewsbury. Thomas was obviously a very successful businessman. He held many high offices in the Counties of Berkshire and Oxfordshire including serving as a member of parliament in 1432. He also served as Sheriff of both counties. In 1442 he was given a commission to basically persuade his neighbors to 'loan' money to the King and bring it post haste to the Royal Exchequer. According to the Royal Berkshire History article on Thomas, he was never knighted and therefore was not Sir Thomas but rather only Thomas Fettiplace. He seems to have died not long after the 1442 commission. Beatrice died on Christmas day in 1447. 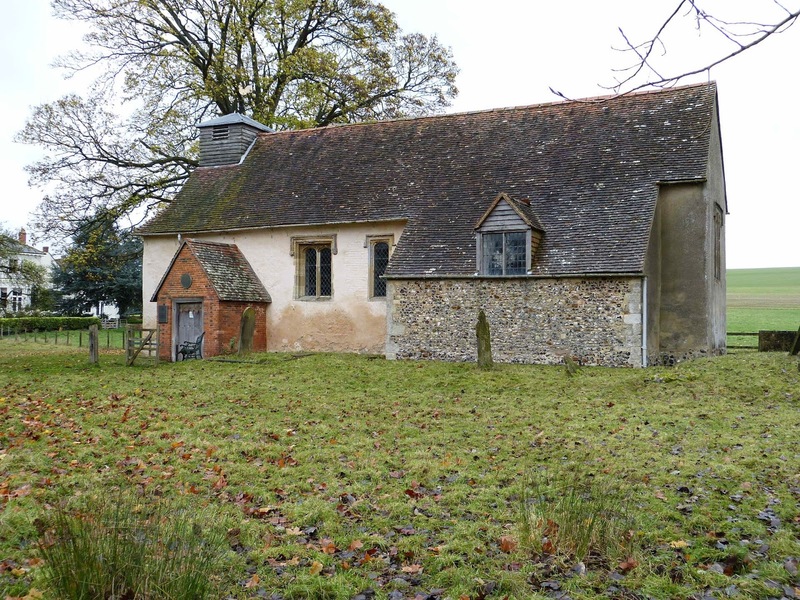 They are buried in the little church of St. Thomas that once served the manor of East Shefford. Their alabaster tomb was commissioned by their son John. 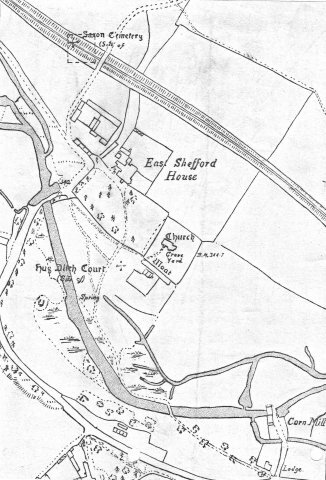 The manor house of East Shefford was demolished in 1871. The village of East Shefford no long exists. A P Baggs, Eleanor Chance, Christina Colvin, C J Day, Nesta Selwyn and S C Townley. "Bampton Hundred," in A History of the County of Oxford: Volume 13, Bampton Hundred (Part One), ed. Alan Crossley and C R J Currie (London: Victoria County History, 1996), 1-5. British History Online, accessed May 25, 2016, http://www.british-history.ac.uk/vch/oxon/vol13/pp1-5. "Parishes: East Shefford or Little Shefford," in A History of the County of Berkshire: Volume 4, ed. William Page and P H Ditchfield (London: Victoria County History, 1924), 234-238. British History Online, accessed May 15, 2016, http://www.british-history.ac.uk/vch/berks/vol4/pp234-238. David Nash Ford, "Thomas Fettiplace," David Nash Ford's Royal Berkshire History, (http://www.berkshirehistory.com : accessed 28 May 2016). Nathaniel L. Taylor, "Beatrice Fettiplace (Ancestress of Gov. Thomas Dudley) : A Summary", PDF file. This was written in 2002 and is the latest information on the ancestry of Beatrice Fettiplace. Taylor is the editor and publisher of the The American Genealogist. Donald Lines Jacobus, "The Fettiplace Family," The New England Historical and Genealogical Register, Vol. 123 (October 1969) 254, American Ancestors (http://www.americanancestors.org : accessed 25 May 2016).